This is such a cute family moment, not too different from what Eileen and I have had recently with Brendan. 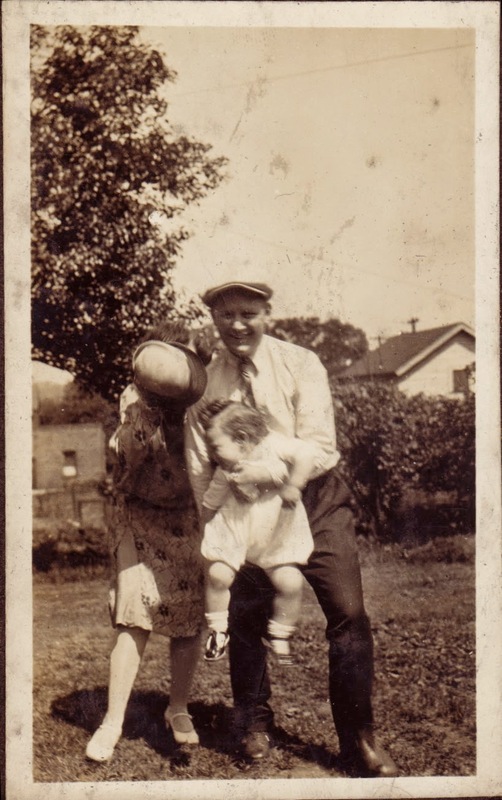 It looks to me that my grandpa Chuck Lowry is about seven or eight months old and my great grandmother is trying to get him to laugh. (As I can’t see that person’s face, I’m going to assume it’s her.) Great grandpa is having a good laugh at the moment. This candid is a nice change or pace from the staged shots I have so many of. Charles Lowry (1924-2007), Charles Lowry (1899-1975) and Margaret Pepperney Lowry (1902-1980), photograph, taken at unknown location around 1925; digital image, photocopy of original, scanned in 2013 by Joseph Lowry; privately held by Mary McCaffrey, [address for private use], Canton, Ohio. Family of three standing in the backyard. Provenance is Mary Pepperney Lowry to Charles Lowry to Mary McCaffrey.